This year's record snowfall on the Sierra took road crews a month longer than normal to clear from the east-west passage. This is Saddlebag Lake which is located up the 395 past Mammoth Lakes at the Tioga Pass turn off. This lake is located above 10,000 feet. This picture was taken in August of 2007. A mountain pass across the Sierra Nevada that runs through Yosemite National Park is opening to traffic later than it has in nearly two decades, rangers said Tuesday. Tioga Road opens on Thursday morning, and a day earlier on Wednesday pedestrians and bicyclists will have the road to themselves, ranger Jamie Richards said. 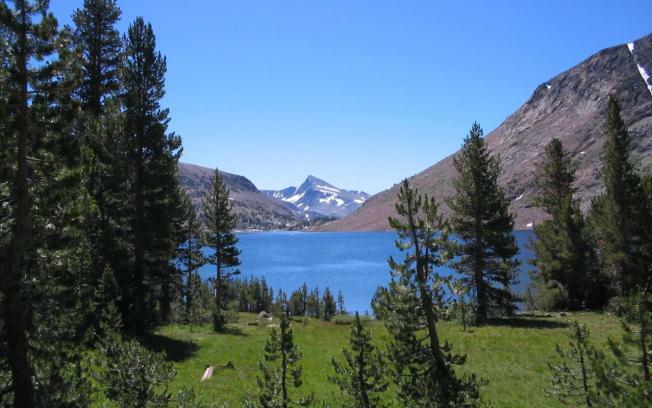 "We're excited to get Tioga Road opened and linking the east and west side of Yosemite National Park," she said. Park records show that it's been 19 years since it opened at a later date. In 1998, workers finally cleared the road -- also known as Highway 120 -- for drivers on July 1. Photos rangers took last week show a building at high elevation along the pass still surrounded by snow and snowmelt rushing across the road. It's expected to take a few more weeks for crews to get cell phone service and plumbing along the road. There is also no place to gas up and buy food along Tioga Road, Richards said.